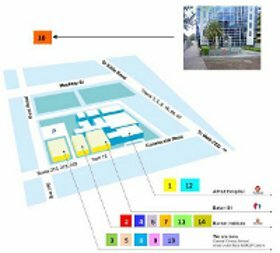 Offices for Departments of Diabetes, Gastroenterology, Medicine, Neuroscience, Surgery and Undergraduate Medical Education Directorate are distributed between Levels 5 and 6 of the Alfred Centre. Limited spaces available only on request. Staff car parking, see CCS Intranet. Public parking is to the rear of Baker Lane, between the Burnet Building and the Alfred Centre. There are two entrances to the AMREP Burnet building, 89 Commercial Rd. The entrance for the NTRI and ACBD is set back from Commercial Road to the left of the main entrance of the building (85 Commercial Rd). The entrance for DID is via the main front entrance of the Burnet building. MAPrc offices and laboratories are located at 607 St Kilda Road, south and west of the AMREP precinct. See list and organisational structure of CCS centres and departments.